An engaged and knowledgeable LP base is fundamental toward building a long-term private equity franchise. The mission of Sutton Hill is to help GPs set in motion a virtuous cycle driven by LP satisfaction. Many small and middle market private equity firms do not have the resources for a dedicated investor relations professional, and thus LP communications are often inconsistent in style, substance and execution. This often leads to less than optimal interaction and engagement between a GP and LPs, especially during non-fundraising periods, which in turn can lead to more painful and protracted fundraising processes. By providing forward-looking plans, ensuring consistent communications, and / or absorbing the unpredictable inquiries that arise from LPs, Sutton Hill allows deal partners to focus on return-enhancing activities while still delivering exceptional client service. We do not seek to replace the invaluable interactions that naturally occur between deal partners and LPs, but rather to enhance those interactions and extend them over the life of a fund - instead of only during fundraising. We can also help ensure that communications, questions and inquiries, co-investment syndications, and meetings with existing and potential investors are handled seamlessly, even during peak load times. Engaging and responding to LPs outside of the formal channels is a key factor that contributes to LP satisfaction. Even GPs who say “we never hear from our LPs” are leaving value on the table. Our goal is to streamline the time deal partners spend on investor relations efforts to only that which adds value commensurate to their other activities. 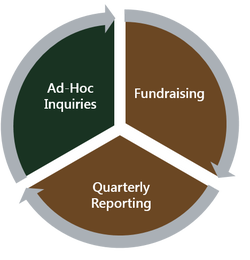 Sutton Hill can provide helpful support, templates, constructs and answers for the vast majority of requests and questions that surface during diligence and throughout the life of a fund. Our goal is to align each limited partner's perception of the fund exactly as the GP would intend. The following diagram illustrates how inserting an investor relations specialist can free up capacity for the GP while improving upon the prevailing communications construct. Deal professionals responding to general inquiries from LPs takes time and focus away from sourcing, executing and monetizing investments.